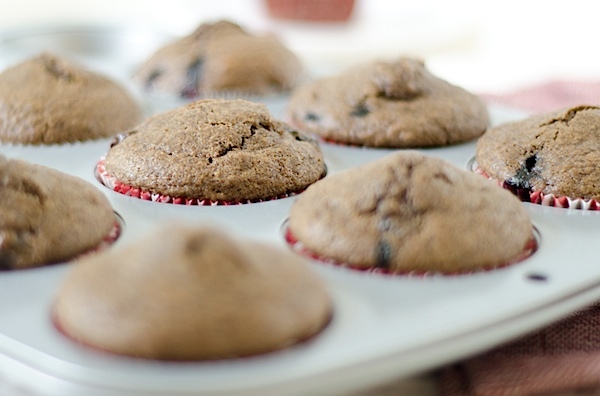 My parents have a knack for whipping up delicious, wholesome muffins. I used to like the more traditional, dessert-like muffins, but I’ve been converted in recent years. 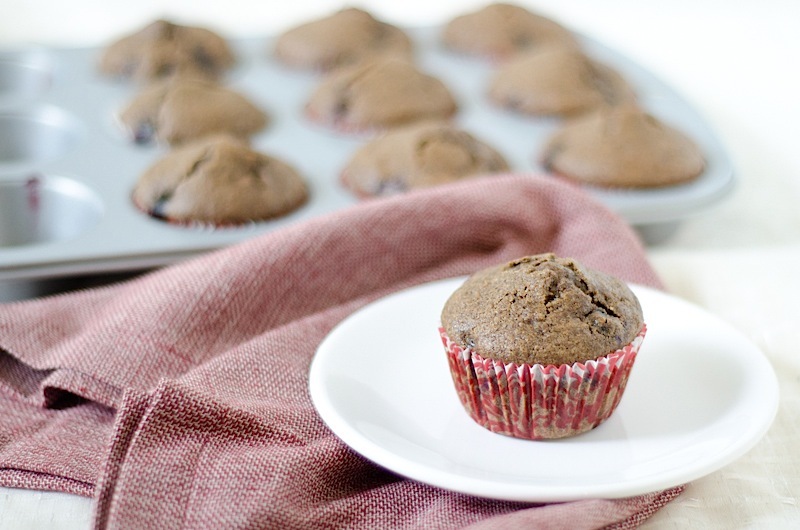 I actually kind of like it when muffins taste more on the healthy side. Call me crazy. We’ve already established that I’m weird. At first bite, I found this muffin experiment to be a little off. The muffins were barely sweet, and it had an interesting flavor thanks to the buckwheat flour. But, they grew quickly on me. I ended up really enjoying the not-so-sweet and naturally molasses-like flavor. 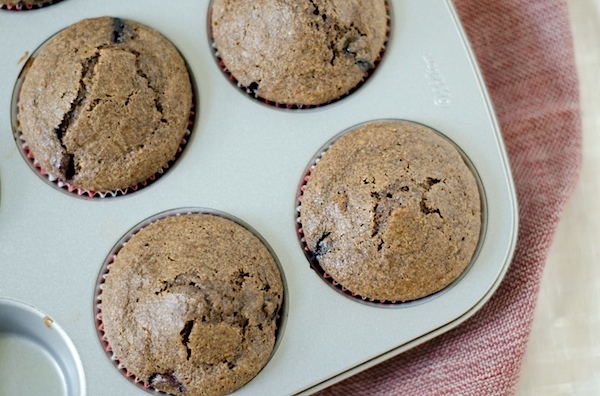 I must be honest, not everyone will find these muffins delicious. 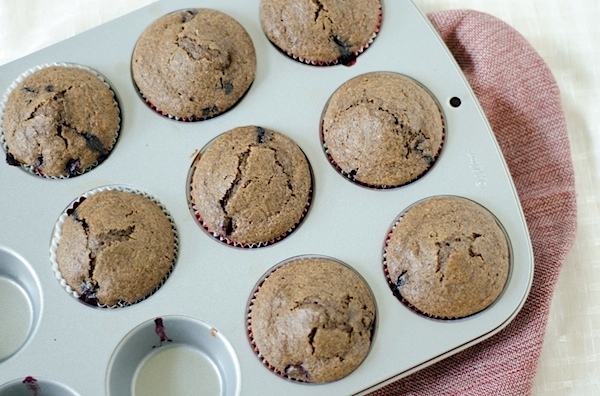 If you’re looking for super sweet and uber buttery blueberry muffins, then you may want to skip this one. 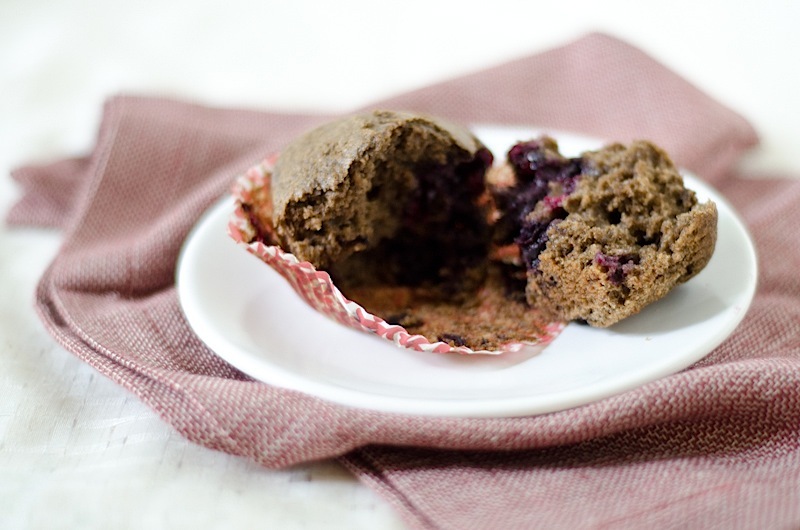 If, on the other hand, you prefer a heartier yet lighter and not-so-sweet muffin, this one may be your ticket. These have a naturally rich molasses-like flavor (I think because of the buckwheat flour and sucanat), which I really enjoy. Swap out the flours to use your favorites or even consider all purpose (unbleached, if possible) flour to keep things simple. 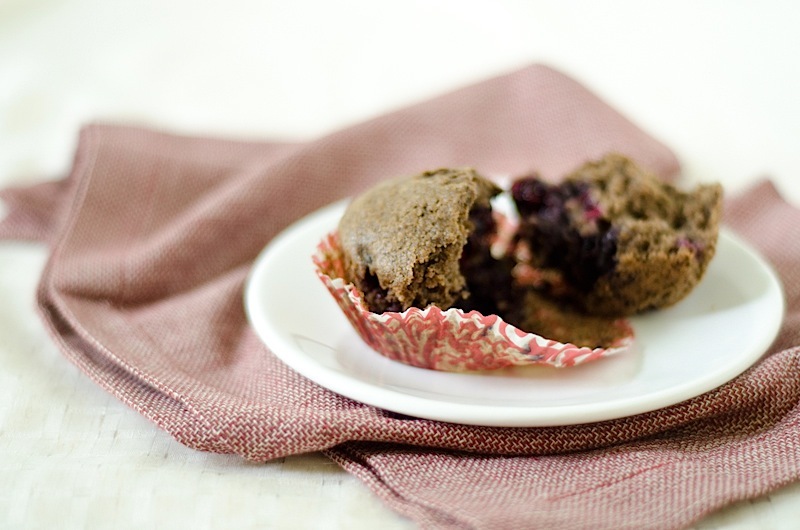 And if you want something sweeter than these, consider using raw sugar in lieu of sucanat or adding extra sweetener. 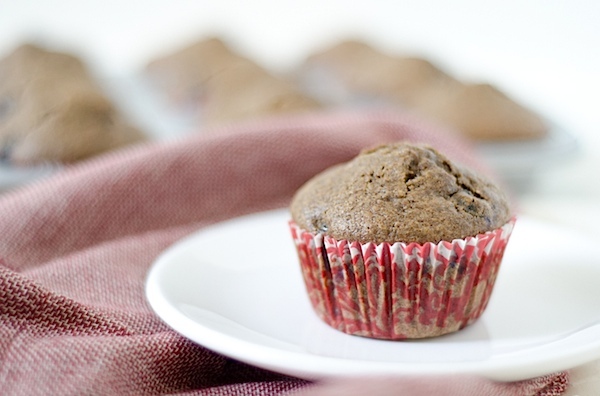 Alternatively, you could also drizzle the already-baked muffins with a little honey. In a large bowl, combine spelt flour flour, buckwheat flour, flaxseed, baking powder, and salt. Whisk till evenly combined. Pour wet ingredients into bowl with dry ingredients. Stir gently to combine, just till all dry ingredients are mixed in (careful to not over-mix – batter will be a little lumpy and pretty liquidy). Gently stir in blueberries. Bake muffins for 18-22 minutes, until muffins are cooked through (a toothpick inserted in the center of the muffin or loaf comes out clean). 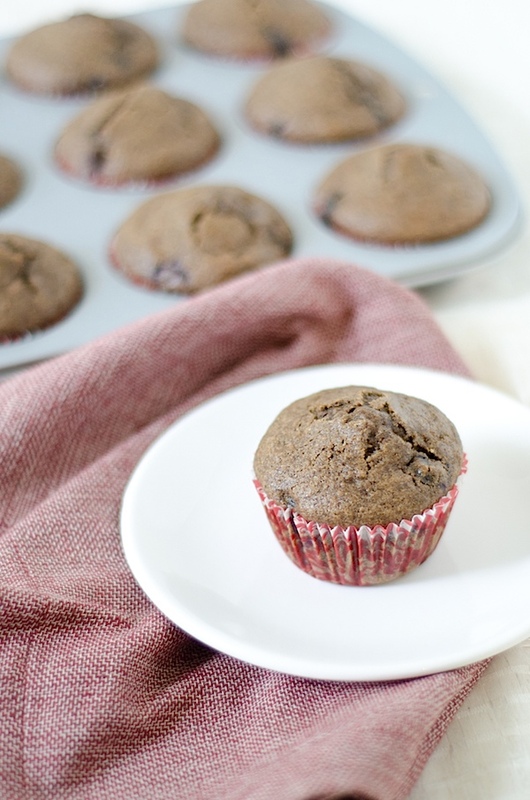 Note: It will be hard to tell when the muffins are done since the buckwheat gives them a naturally dark color, and it will be hard to see when the edges start to brown, etc. Your best bet is to use the toothpick check. Remember you can freeze any leftovers you think you won’t eat fast enough. I find frozen muffins defrost easily and by also putting them in the oven for a couple minutes that they taste fresh-baked again. Did you like this recipe? Consider clicking the Facebook Like button or using one of the other share buttons to share this recipe with your friends. Remember, you can get free updates by clicking here. I just wrote this blog post in the car! We’re on a road trip for an early birthday celebration. I’ve got my DSLR with me with plans to take lots and lots of photos! Can’t’ wait to share them with you. What are you up to this weekend? Thanks for the recipe! 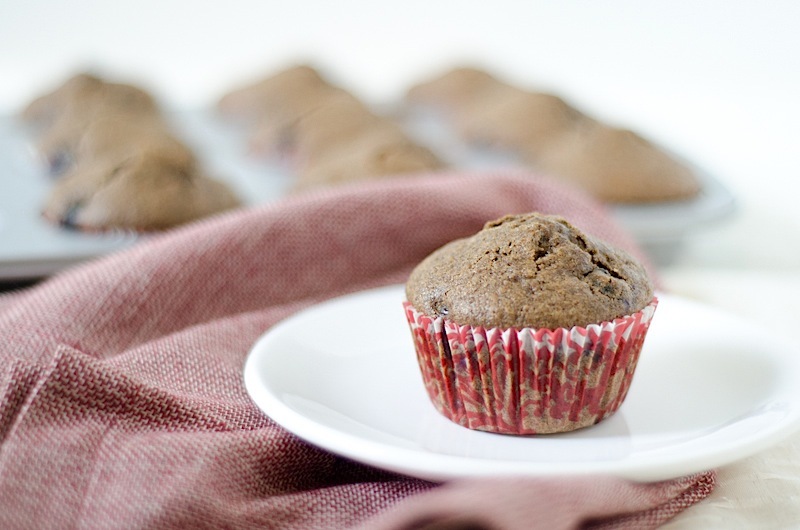 I made these muffins, and they are great!!! I only had sugar on hand, and they are plenty sweet that way. I want to eventually try them with sucanant. My 16 month old absolutely loved them! I will be making these again! Hi Katherine, Thank you so much for checking out my recipe! 🙂 Let me know how you like them with sucanat. I’m glad to hear the recipe is kid-friendly! Thanks for sharing!